I always wanted to live by the ocean. That’s why we settled in Quincy almost a decade ago, a few blocks from Wollaston Beach, where we can sometimes smell the sea from the subway platform. During our house hunt, we researched all kinds of data — pricing, walkability, property taxes, schools, commute times — but one thing we ignored was elevation. Unlike a few other houses we looked at, this one didn’t require flood insurance, and that was good enough for us. But it turns out, we’re only about 14 feet above sea level on a good day — and the level of that sea keeps rising. It’s got me worried about whether this almost 100-year-old home will make it another 100 years. That’s what prompted me to write a story about house hunting in the age of climate change for the Boston Globe last week. I worry about our house, sure, and our investment in it, but also about our entire coastal community. Seaside towns all over Massachusetts will face higher high tides, more forceful waves, more powerful storm surges, increased precipitation, and more frequent flooding in the coming decades. Boston Harbor could rise three to seven feet by the end of this century, according to projections by Climate Ready Boston, and rising sea levels mean any given storm will cause more flooding in the future than it would today. Routine flooding would threaten $80 billion of real estate in Boston alone. And that’s just the stuff we can predict. “Because human-caused warming is happening at such a fast rate, we’re essentially destabilizing the climate, so we get unexpected impacts, like a deep freeze as far south as Texas,” said Ellen Douglas, associate professor of hydrology at University of Massachusetts Boston, who worked on the Climate Ready Boston report. “The climate doesn’t respond in a linear manner,” she added, because feedback loops amplify the effects of warming: For example, warmer winters lead to less snowpack, which means more heat is absorbed by land, leading to even more warming. “By the end of the century, if we follow the highest emissions scenario, [Boston] could see as many as 90 days above 90 degrees Fahrenheit,” Douglas said. Prolonged and hotter heat waves are my personal hellish nightmare. But anyway, it’s unsettling to think the ocean might erode not just our beautiful beaches, but also our property values and home equity. In short, a lot of us will need to get more familiar with FEMA’s Federal Flood Insurance Program at the very least. Check FEMA’s flood maps to see if your home requires mandatory flood insurance. If you buy in a flood plain — a Special Flood Hazard Area (SFHA) — your lender will require that you purchase flood insurance. It’s like how they require you to purchase homeowners insurance — they don’t want your house burning up or floating away when you still owe $200,000 on it. If you pay cash for a house, however, even in a flood plain, you’re not required to purchase flood insurance. Nobody really cares (except you and your fan club) if you lose the house if you paid for it upfront. However, you may want to buy flood coverage anyway, because regular homeowners insurance in most cases does NOT cover flood damage. While flood insurance is subsidized, it’s still expensive. The average cost of flood insurance in Massachusetts was $1,198 a year in 2016, or about $100 a month. The rates are standardized but vary depending on the level of risk (e.g., waterfront vs. low-lying) and the value of the home (multi-million-dollar oceanfront estates can see flood insurance premiums upwards of $20,000 a year). Flood maps change – but rarely in your favor. As I mentioned, when we bought our home, we weren’t in the flood plain. But guess what: Five years later, FEMA updated the local flood maps, and now one corner of our lot is in the flood plain, and we’re forced to pay flood insurance. Quincy challenged the new maps and we appear to be back out again, but be aware that those maps can and will change, especially as sea levels rise. Flood insurance only covers up to $250,000 in structural damage and $100,000 in possessions, and generally doesn’t cover personal property below the first floor. For example, if you have a partially finished basement, your furnace and foundation would be covered, but probably not the leather couch, TV, or exercise equipment. But the situation is a little stickier with vacation homes. Flood premiums on second homes can get way more expensive since they’re not subsidized like a primary residence, and you may not be able to transfer an existing policy. So, to recap: Flood insurance is an expensive pain in the neck, and coastal communities are in a bit of a precarious spot as the ocean continues to rise around them. And yet, Nela Richardson, chief economist at national real estate brokerage Redfin, told me that home buyers just aren’t thinking about climate change in their home searches. If anything, she said, they’re buying up waterfront and flood-prone properties with reckless abandon and paying a premium for it. 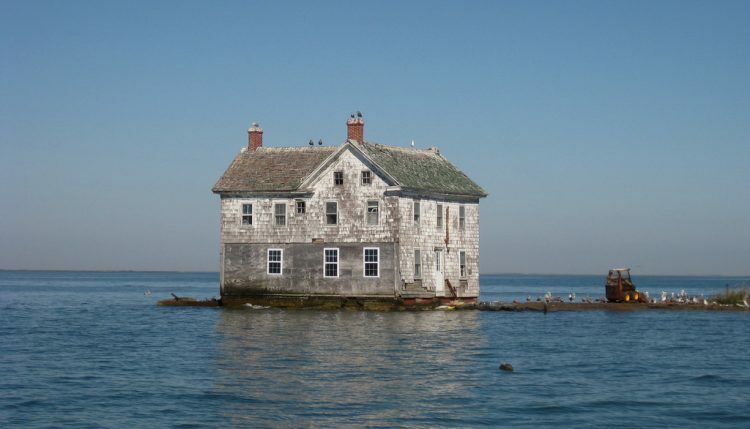 “The flood insurance is viewed as an annoyance or a cost, and there’s still not a widespread psychology that the reason for the insurance is because of the risk, and that the risk is growing because of climate change,” Richardson said. Jim McGue, owner/broker at Granite Group Realty in Quincy, said buyers are in such a weak position in this hot market that they can’t afford to worry about it. “Three years ago, people would snub their nose at a flood insurance house,” he told me. But now, there are so few homes for sale that it’s just one more concession buyers are willing to make, like waiving their right to a home inspection. Indeed, in a recent Redfin survey of home buyers, only 9% said they avoided coastal or low-lying areas, and 13% said they were leery of waterfront property. However, a full 30% said they were looking to buy an eco-friendly home — which seems to indicate that buyers are concerned about climate change on a grand scale, but don’t consider themselves all that vulnerable to it. What could change that, Richardson said, is a series of destructive storms. “But we’ve seen it with Hurricane Sandy and other really devastating storms, that after a few years the developers come back and build in those same risky areas,” she said. Because it’s subsidized by the government, FEMA’s flood insurance program is politically fraught. Studies have even shown that the program encourages people to live and build in high-risk areas at the expense of other taxpayers. So, as pricey as flood insurance is right now, it could (and maybe should) get even more expensive in the future. The thing that freaks me out the most, though, is the potential for a massive collapse in local real estate values, or coastal ghost towns that are simply no longer viable places to live. What if my house is okay, but so much of my neighborhood is ravaged by floods that everyone leaves, so there’s not enough people to support the local businesses and they close up, and the whole place basically falls into a state of ruin? Not only would I mourn the loss of my community, but I — or rather, my kid, more likely — would be the proud owner of a house nobody would ever buy. Gratefully, while we can’t expect any help from Washington at present, there are some brilliant thinkers here in Boston trying to grapple with this slow-motion crisis. One idea gaining traction would be to build an enormous sea wall stretching from Deer Island to Hull, or perhaps linking some of the Boston Harbor islands, to even out water levels and reduce the risk of storm and tidal surges for the communities along Boston Harbor. But there are more localized and less grandiose mitigation efforts to be made as well. “Stay out of the 100-year or 500-year floodplain for sure,” said Douglas, “and take seriously disclosures of past stormwater flooding – I learned this one the hard way. Look for evidence of flooding in basements, like water lines or mold on basement walls, degraded slabs.” Smaller homes are cheaper to heat and cool, and easier to retrofit if necessary, she added. Beyond that, throw your support behind local leaders who take climate change seriously and are looking for solutions at the local level. Because not everyone is taking this seriously. While a clear majority of Americans now accept and even worry about man-made climate change, nearly one in five (19%) is what Gallup describes as a “Cool Skeptic.” That is, they don’t believe global warming is caused by humans, nor that it will pose a threat in their lifetime, and they consider media coverage of climate change to be exaggerated. That’s disturbing, to be sure. But there is a small silver lining to be found: We’re going to need a few suckers climate deniers willing to buy all this flood-prone real estate one day.